NTi Audio offers users of its MR-Pro, DR2 and Talkbox a Wav File converter software for Windows. Mildon Studios recently closed to leave room for Mildon, with a new site and new developments. 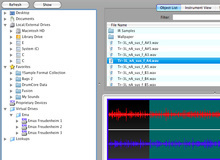 Breezer is a audio and sample library manager which helps you to find and preview your audio files. Monkey Tools has announced the release of versions 2.0 of Library Monkey Pro and Sound Grinder Pro. Audiofile Engineering has updated Sample Manager to version 3.4. CPU Productions today announced the release of a new version of Groove Detective (and it’s MIDI sibling). ProXL has updated Sonic Explorer to version 1.1.